Since 1993, Skyline Princess Cruises has served the cruising needs of the New York Metro and North Shore Long Island areas, providing everything from simple sightseeing tours to extravagantly catered affairs. Our management team has over 70 years of combined dinner cruise and yacht charter experience in New York, New Jersey, and Connecticut waters. We take pride in our A+ rating with the Better Business Bureau. You can be comfortable knowing your event is in good hands. We depart from several Ports of Departure throughout the tri-state area from. Click here for Ports! Our vessel, the Skyline Princess, was specifically designed for year-round, all-weather operation, the entire vessel is fully climate controlled. Our third deck can be open or completely enclosed, so no matter what the season – rain or shine – you always have complete use of all of our levels, and your plans never have to change based on weather conditions – you can take that Manhattan or Long Island Sound cruise anytime! The Skyline Princess is 120-feet long and 31-feet wide with three full passenger levels, featuring an enclosable third deck, complete with skylights and a private bridal suite. The Skyline Princess is US Coast Guard certified for up to 450 passengers. 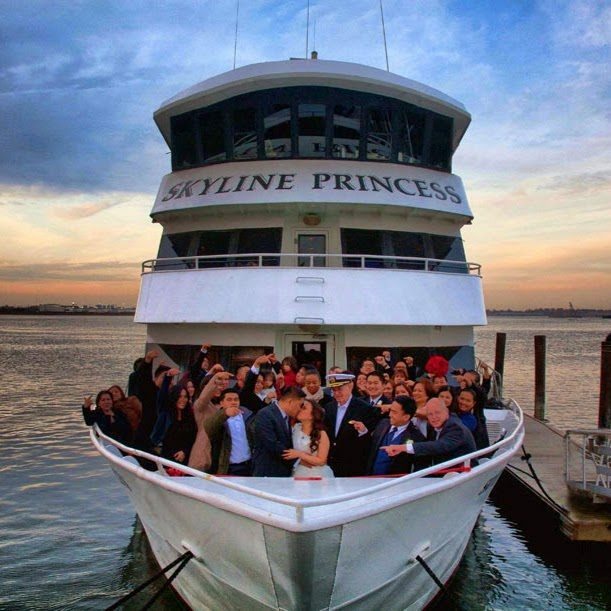 This makes the Skyline Princess the perfect venue for larger parties. The Skyline Princess has the highest passenger capacity of any yacht in New York-based outside of Manhattan and is widely considered the New York Harbors most versatile dinner cruise charter yacht. For over 20 years, we have been offering public Lunch, Brunch, and NYC Dinner cruises from Queens in addition to our private catered events. We are an owner-operated company, therefore our client’s work directly with the people responsible for delivering the personalized service they expect and deserve. We also offer flexibility that can’t be found elsewhere in regard to times, menus, and locations, of our privately chartered cruises. For more information, please Contact Us – we look forward to sailing with you soon!